The Quartedacousingly.info is a misleading web-site. Did you get unwanted pop ups or notifications from Quartedacousingly.info and wonder where it came from? It’s a sign that your computer has become a victim of the ‘ad-supported’ software (also known as adware). Here’s below how the Quartedacousingly.info pop-ups looked like when I got it on my personal computer. The ad-supported software can bring a security risk to your computer. So, do not ignore it! 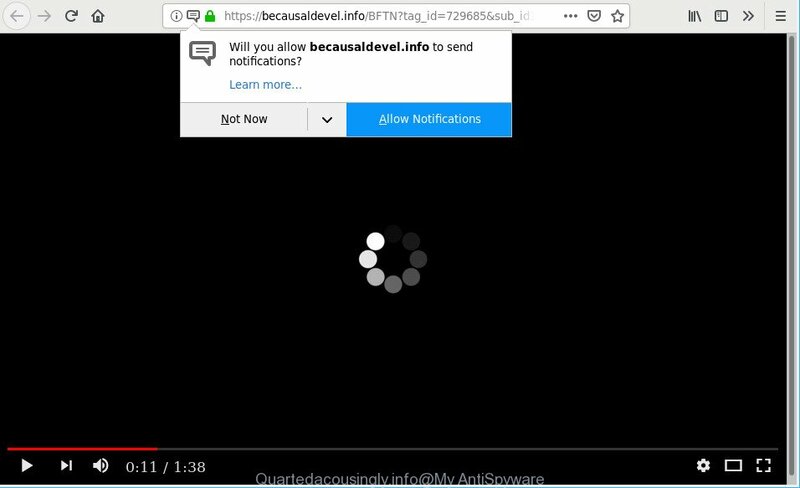 Of course, the Quartedacousingly.info is just an website, but the adware uses it to open undesired ads, pop-ups and notifications, even without your permission and desire to see it. The annoying advertisements can be just the beginning, because your personal computer is infected with harmful software, so the amount of pop up ads in the future may increase. Its appearance will prevent you normally surf the Internet, and more, can lead to crash the web-browser. In order to remove Quartedacousingly.info pop ups, start by closing any programs and pop ups that are open. If a pop up won’t close, then close your web browser (MS Edge, Microsoft Internet Explorer, Google Chrome and Firefox). If a program won’t close then please reboot your computer. Next, follow the steps below. The following instructions is a step-by-step guide, which will help you manually delete Quartedacousingly.info popup advertisements from the MS Edge, Firefox, Chrome and Internet Explorer. If you do not want to remove adware in the manually due to the fact that you are an unskilled computer user, then you can run free removal tools listed below. Some PUPs, browser hijacking programs and adware can be deleted by uninstalling the free applications they came with. If this way does not succeed, then looking them up in the list of installed programs in MS Windows Control Panel. Use the “Uninstall” command in order to delete them. It will open the Windows Control Panel as displayed on the screen below. It will show a list of all applications installed on your PC. Scroll through the all list, and uninstall any suspicious and unknown apps. To quickly find the latest installed applications, we recommend sort applications by date in the Control panel. Resetting Firefox web browser will reset all the settings to their original state and will remove Quartedacousingly.info pop ups, malicious add-ons and extensions. However, your saved bookmarks and passwords will not be lost. This will not affect your history, passwords, bookmarks, and other saved data. Run the Mozilla Firefox and click the menu button (it looks like three stacked lines) at the top right of the browser screen. Next, click the question-mark icon at the bottom of the drop-down menu. It will open the slide-out menu. Click the “Refresh Firefox” button at the top right of the Troubleshooting Information page. Select “Refresh Firefox” in the confirmation prompt. The Mozilla Firefox will begin a procedure to fix your problems that caused by the Quartedacousingly.info adware. After, it is finished, press the “Finish” button. By resetting Internet Explorer web browser you restore your browser settings to its default state. This is basic when troubleshooting problems that might have been caused by ad supported software that responsible for the appearance of Quartedacousingly.info pop ups. First, start the Microsoft Internet Explorer. Next, click the button in the form of gear ( ). It will show the Tools drop-down menu, press the “Internet Options” as shown on the image below. In the “Internet Options” window click on the Advanced tab, then click the Reset button. The IE will display the “Reset Internet Explorer settings” window as shown in the figure below. Select the “Delete personal settings” check box, then click “Reset” button. Reset Chrome settings to get rid of Quartedacousingly.info pop-up ads. If you are still experiencing issues with Quartedacousingly.info redirect, you need to reset Google Chrome browser to its original settings. This step needs to be performed only if adware has not been removed by the previous steps. You’ll see the list of installed extensions. If the list has the addon labeled with “Installed by enterprise policy” or “Installed by your administrator”, then complete the following tutorial: Remove Chrome extensions installed by enterprise policy. Anti Malware applications differ from each other by many features like performance, scheduled scans, automatic updates, virus signature database, technical support, compatibility with other antivirus applications and so on. We recommend you run the following free applications: Zemana, MalwareBytes Anti-Malware and Hitman Pro. Each of these programs has all of needed features, but most importantly, they can detect the adware and delete Quartedacousingly.info pop-up advertisements from the Mozilla Firefox, Chrome, Internet Explorer and Edge. Zemana is free full featured malicious software removal tool. It can check your files and Windows registry in real-time. Zemana Free can help to delete Quartedacousingly.info ads, other PUPs, malware and adware. It uses 1% of your system resources. This utility has got simple and beautiful interface and at the same time effective protection for your system. Once the download is finished, close all software and windows on your system. Double-click the set up file named Zemana.AntiMalware.Setup. If the “User Account Control” prompt pops up as displayed on the image below, click the “Yes” button. It will open the “Setup wizard” that will help you setup Zemana Free on your computer. Follow the prompts and don’t make any changes to default settings. Once setup is finished successfully, Zemana Free will automatically start and you can see its main screen as displayed in the following example. Now click the “Scan” button for checking your computer for the adware that causes multiple unwanted pop-ups. Depending on your PC, the scan may take anywhere from a few minutes to close to an hour. 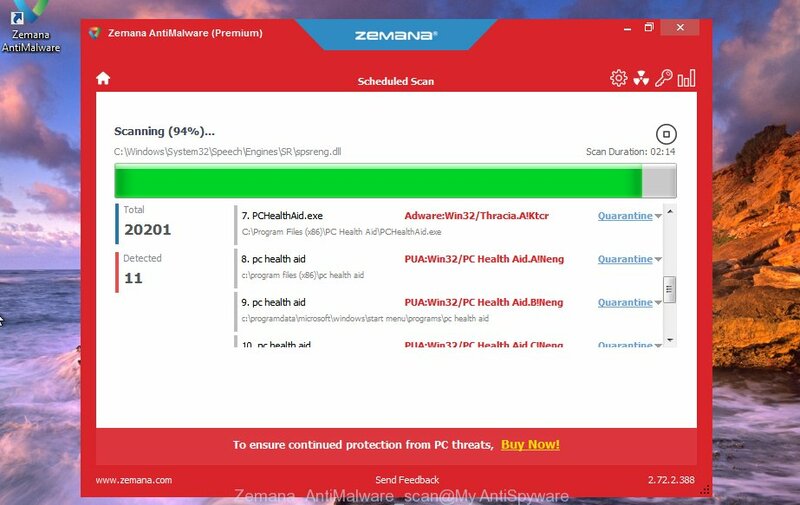 When the scanning is complete, Zemana Anti-Malware will display a list of detected items. You may get rid of items (move to Quarantine) by simply click “Next” button. The Zemana Free will remove ad-supported software that causes a ton of intrusive Quartedacousingly.info pop-up ads. After finished, you may be prompted to reboot the computer. It is also critical to protect your browsers from harmful web sites and ads by using an ad-blocking application such as AdGuard. Security experts says that it’ll greatly reduce the risk of malicious software, and potentially save lots of money. Additionally, the AdGuard can also protect your privacy by blocking almost all trackers. After downloading it, run the downloaded file. You will see the “Setup Wizard” screen as shown in the following example. Follow the prompts. When the installation is done, you will see a window as displayed on the image below. In most cases, the default settings are enough and you do not need to change anything. Each time, when you start your machine, AdGuard will start automatically and block pop-up advertisements, Quartedacousingly.info pop-ups, as well as other harmful or misleading pages. For an overview of all the features of the application, or to change its settings you can simply double-click on the AdGuard icon, which is located on your desktop. These days some free programs makers bundle third-party programs that could be potentially unwanted applications like this adware, with a view to making some money. These are not freeware as install an unwanted programs on to your Windows personal computer. So whenever you install a new free program that downloaded from the Net, be very careful during installation. Carefully read the EULA (a text with I ACCEPT/I DECLINE button), choose custom or manual installation mode, disable all third-party apps. Once you have complete the guide shown above, your computer should be clean from adware related to Quartedacousingly.info redirect and other malicious software. The Firefox, Internet Explorer, Google Chrome and Edge will no longer reroute you to various undesired webpages like Quartedacousingly.info. Unfortunately, if the steps does not help you, then you have caught a new adware, and then the best way – ask for help here.